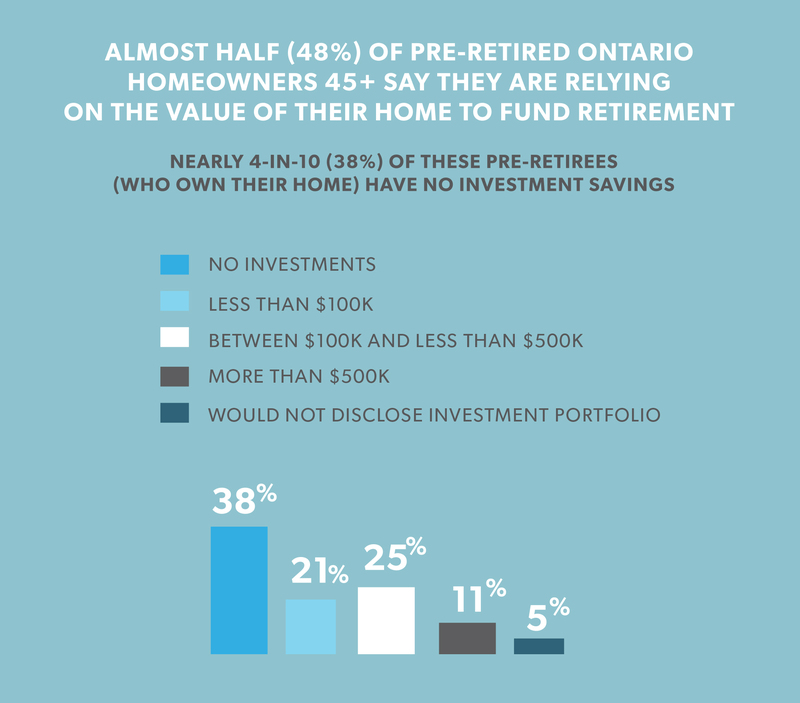 45% of pre-retired Ontario homeowners 45+ are relying on rising home prices to fund their retirement, according to an OSCOSC See Ontario Securities Commission.+ read full definition Investor Office survey. The number Ontarians 65 and older is projected to double from 2.3 million in 2016 to 4.5 million by 2040—by that time, 1 in 4 Ontarians will be 65 or older. To better understand the financial knowledge, attitudes and behaviours of Ontarians who are in or approaching this demographic, the Investor Office commissioned Investing As We Age, a survey of Ontarians age 45 and over. 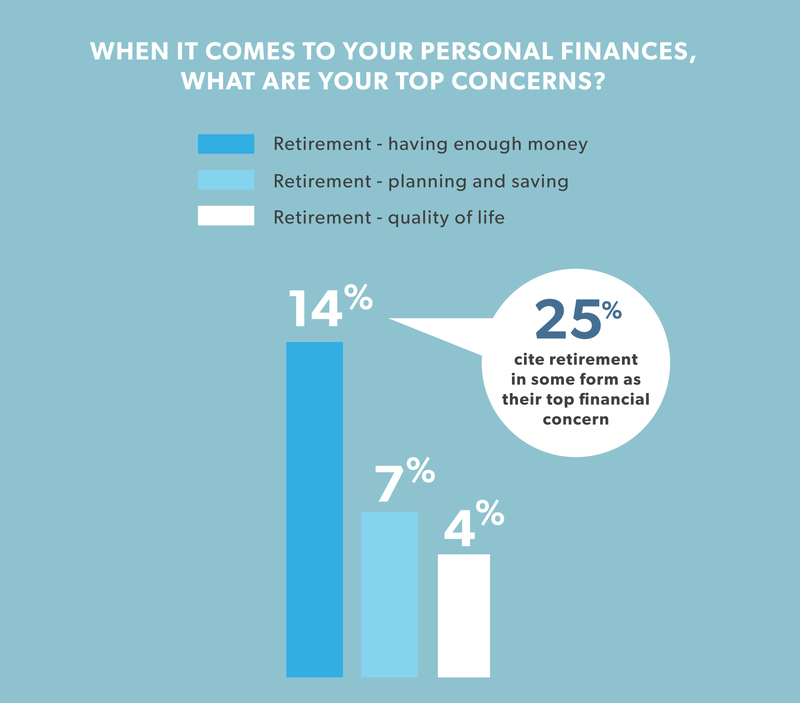 The top financial concerns for 25% of Ontarians 45+ are retirement-related, including having enough money for retirement, planning and saving for retirement, and maintaining quality of life in retirement. Other concerns included having enough money to pay current expenses (13%) and paying off or managing debtDebt Money that you have borrowed. You must repay the loan, with interest, by a set date.+ read full definition (10%). House & Home: The New Retirement Plan? Almost half (45%) of pre-retired Ontario homeowners 45+ say they are relying on the value of their home increasing to fund their retirement. Those who may be least prepared for retirement are among those most likely to report relying on rising home prices. They include homeowners who don’t have a formal plan for retirement or don’t know how much they’ll need to retire, as well as homeowners with larger mortgages, lower incomes, and smaller investmentInvestment An item of value you buy to get income or to grow in value.+ read full definition portfolios. 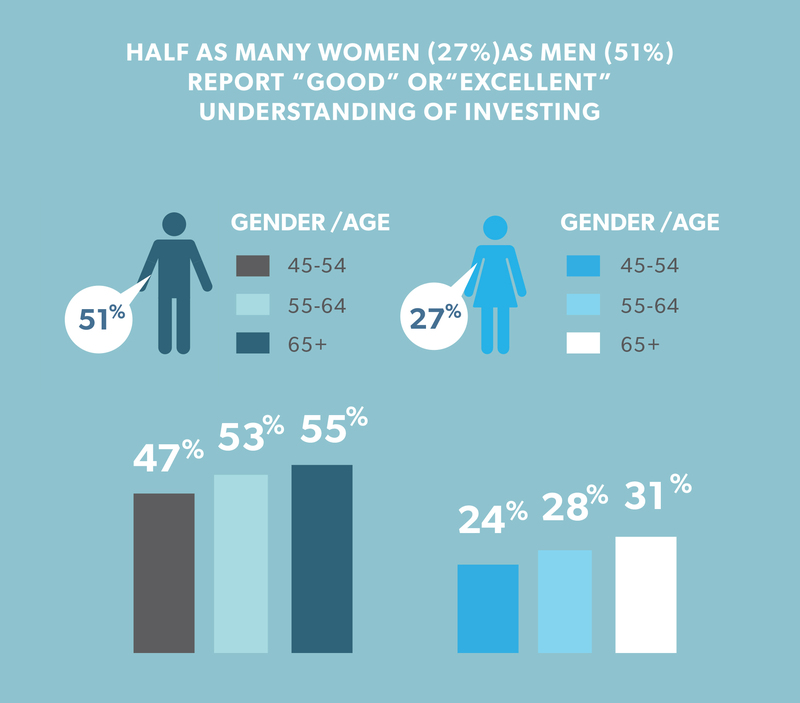 39% of Ontarians 45+ report good or excellent knowledge of investing but, in line with prior research, results diverged by gender: half as many women (27%) as men (51%) reported “good” or “excellent” knowledge of investing. 48% of Ontarians 45+ worry that they will run out of money during retirement, and 2 in 10 (22%) pre-retirees report high stress regarding retirement planning. Pre-retired women 55+ were more likely to report high stress than men the same age. Gender differences extended to the types of financial services men and women use: nearly seven-in-ten (69%) women use a financial advisor, slightly more than the six-in-ten men who do (62%). Almost twice as many men as women currently use an online discount brokerageDiscount brokerage A brokerage firm that charges lower fees to buy and sell investments, as opposed to a full-service brokerage. Does not provide investment advice.+ read full definition (32% of men compared to just 17% of women). We’ve developed a resource hub for homeowners on GetSmarterAboutMoney.ca with questions to think about when considering the role your home can play in your retirement plan. Findings from Investing As We Age also will be used to support the development of the OSC’s Seniors Strategy. Investing As We Age is available online on the Investor Office’s website at InvestorOffice.ca. For Investing As We Age, Innovative Research Group conducted an online survey of 1,516 Ontarians, age 45 years or older, between May 9 and 16, 2017. The results were weighted by age, gender and region using the latest Statistics Canada Census data to reflect the actual demographic composition of the adult population 45+ residing in Ontario. Because the online survey was not a random probability-based sample, a marginMargin A way to buy investments by borrowing money from a stockbroker. You must also invest some of your own money first. The extra that you borrow is your margin. Some rules apply about the size of margin that you can have.+ read full definition of error cannot be calculated. However, a random probability-based sample of this size would have an estimated margin of error of ±2.5%, 19 times out of 20. The estimated margin of error would be larger within each sub-grouping of the sample.